Yesterday morning, I got that 2 CV Citroën. Hey Jacques, new information for you : this model has Dunlop tyres ! 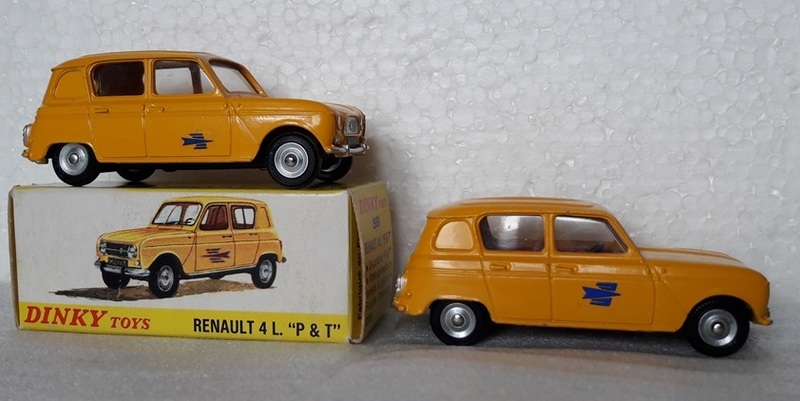 So, I had a look on my others 2 CV ref.558 and I found a yellow model which is fit out with Dunlop tyres ! Even JMR does'nt know it ! My 558 has simple threaded tyres, but 560 postal has the Dunlop. Reading this thread I found my 259 fire engine has cast silver hubs. Although not great condition I attach a picture of some recent colour/spun wheel acquisitions. 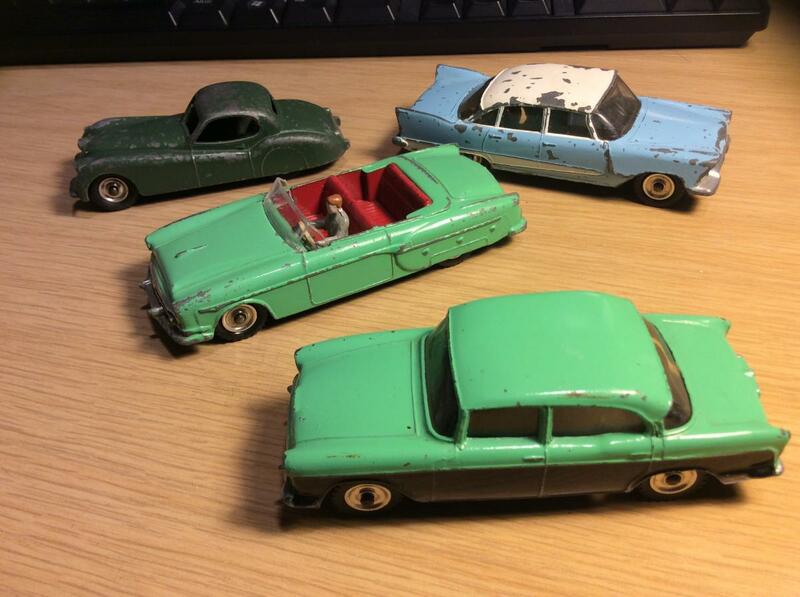 These 3 Dinky toys arrived yesterday but are not really new in my collection. 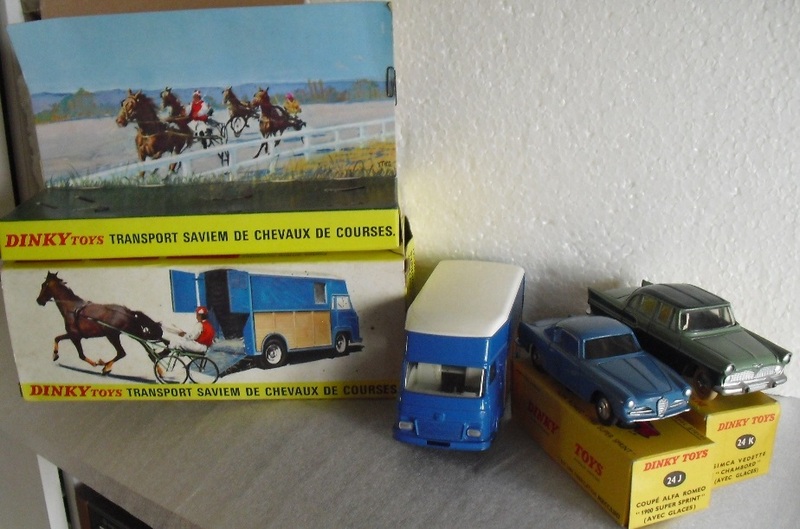 The Simca Chambord and the Alfa was already in my cabinets but in poor conditions. So now, they are replaced by mint in box models. For the saviem, I had a complete exemplar but without box. Now it's in order. 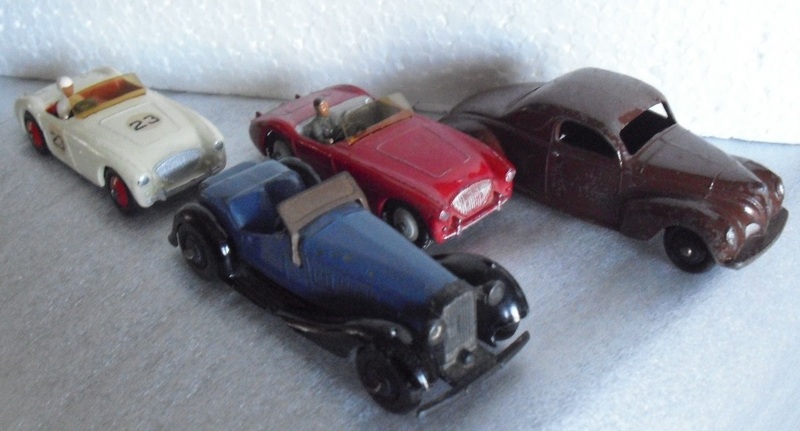 These Dinky came yesterday and I am very happy with the red Austin Healey that I was waiting for a long time. A nice lot indeed, Richard. Your Dinky fleet is growing en growing. 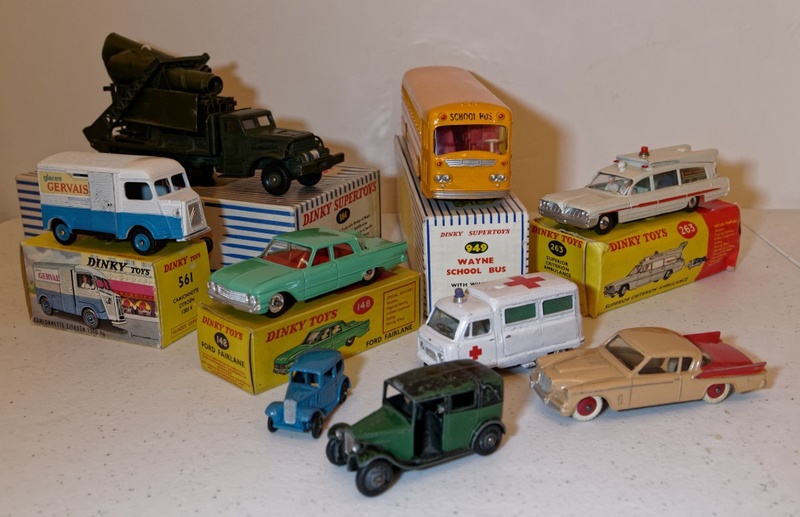 In fact, I moved some Solido, Mercury, Corgi from a cabinet to a cardboard box, to make place for my new Dinky. So it's OK..... for the moment ! I am waiting for three new arrivals and specially one, coming from your country Jan. 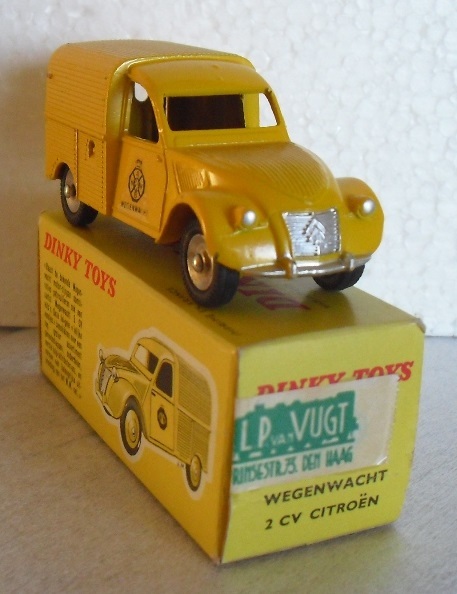 It's the first type, second version (dixit JM Roulet) of the Citroën 2cv van A.N.W.B. On the box there is still a sticker from L.P. van de Vugt in the Hague. Will show you as soon as I receive it. I obtain few Dinky Toys these days -- alas, no room in the car park. But this late version of the Blaw-Knox arrived yesterday. 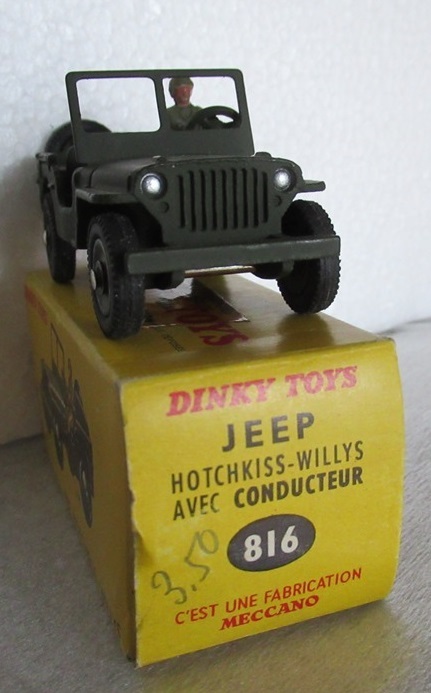 The box shows what I presume to be the original U.S. price of $4.25, which would have been rather a lot for a toy that's almost all plastic. Nice acquisition Jonathan. A question: did Meccano use the same dies somehow for these plastic versions of several toys, or was all new tooling needed for plastic? Going to plastic sure resulted in a very different model from the normal, very solid Meccano construction. I can't answer the question about the tooling, but I'll bet Jacques can. The tooling has at least been modified -- it's funny how I didn't even notice this at first -- because in the metal version, the engine is not exposed, whereas on the plastic model there is visible engine detail. 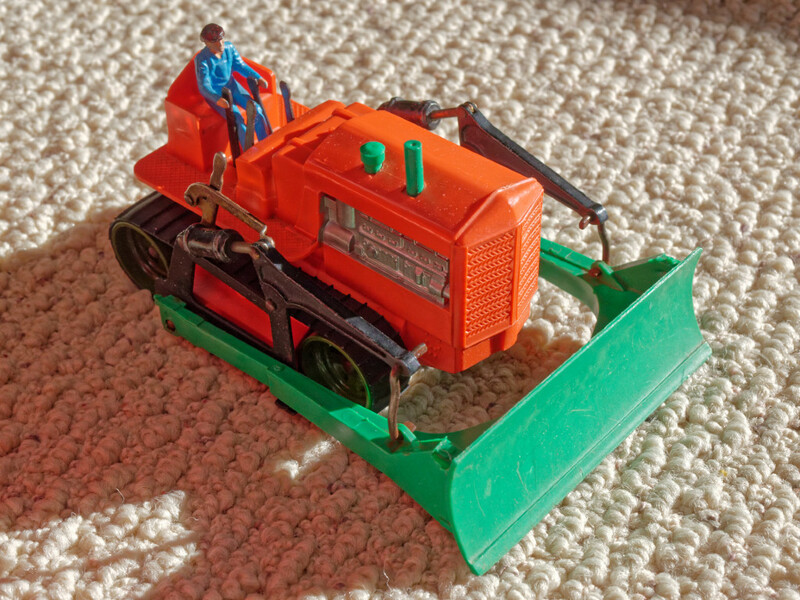 Apparently the plastic version was made only in 1964, yet there are two versions -- the one with olive green wheels that I have obtained, and one (pictured in Jacques' Encyclopaedia) where the wheels are the same color as the blade. The base of the plastic Blaw Knox remains tinplate, but it doesn't contribute much weight, so the whole thing is surprisingly light. Injecting plastic in a die made for zamac is no problem as the melting temperature is lower. It has been done many times by Meccano U.K. for testing new dies. 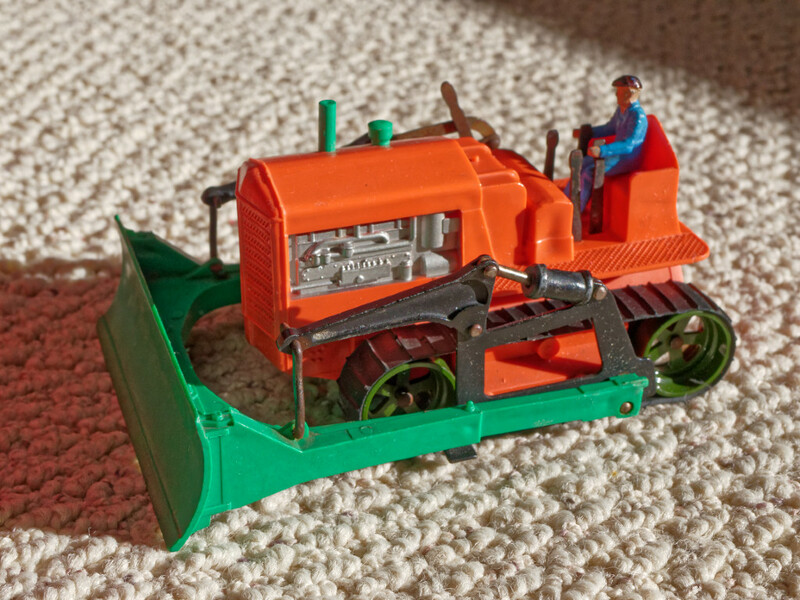 The base plate has been modified for the plastic dozer on which the plate is attached by only one screw when the on the zamac model it is attached by three rivets. There is no evidence that the die has been modified but it is very likely that the mould for the plastic model is entirely new as three out of five of it's parts had to be made new. I have not seen the British Standard for toys but it may contain a weight / size ratio limit. This limit may be one of the reasons for turning the bull dozer to plastic and to make some large Dinky out of aluminium. Thanks, Jacques -- I knew you would have the answer! As to the switch to plastic having been required by British standards, I'm dubious. 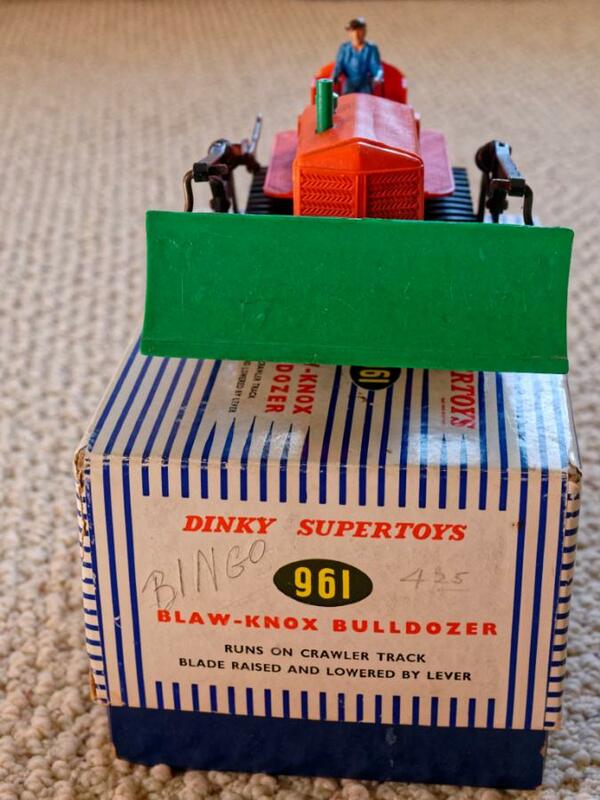 Yes, the metal Blaw Knox could double as a weapon in the hands of an angry child -- but Meccano would go on to produce some equally massive items later. I'm thinking of the 963 Road Grader, 924 Aveling Barford Dump Truck, and 977 Shovel Dozer for example!! 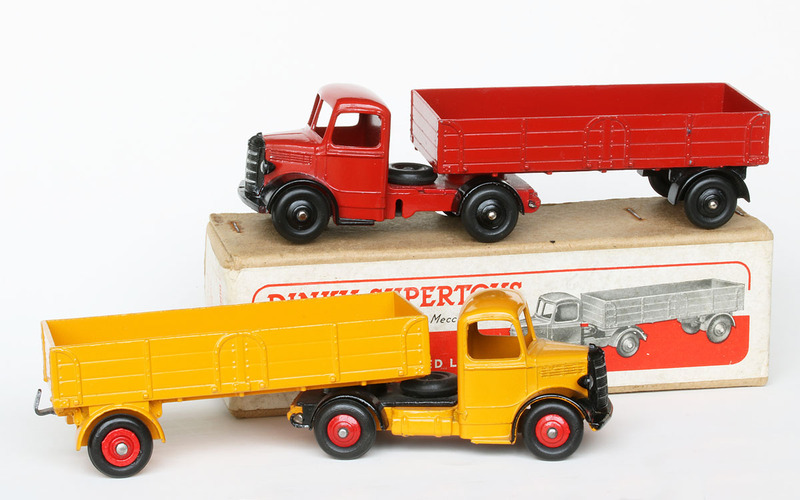 In my understanding, the plastic version was an excercise in cost saving - there was no BSI (British Standards Institution) ruling on toy weight, as has been said there were some much heavier diecasts on the market. 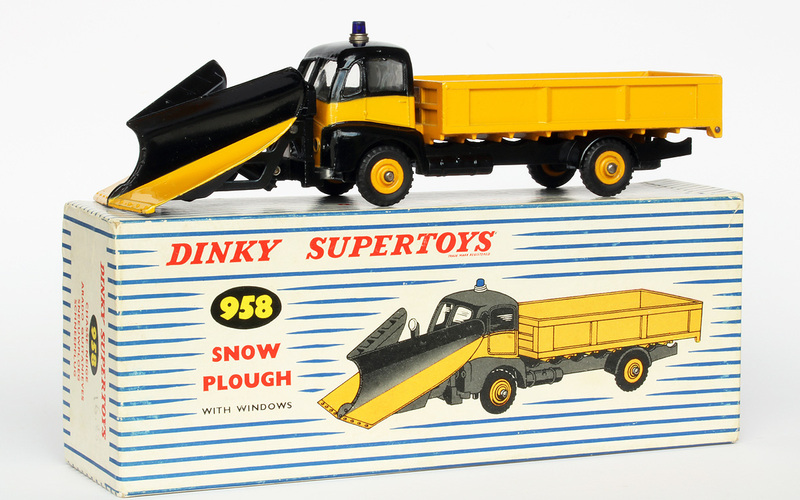 On a sadder note, I bought one of these along with several other obsolete Dinkies when a local toyshop closed down in the early 1970's. Upon opening the box to find a plasic toy inside, I was disappointed, and not realising the potential rarity, I swapped it with a friend for other toys. It met its' end at the mercy of his brothers' air rifle a few days later. Incidentally, the wheels were the same colour as the blade and exhaust. Interesting discussion on the Blaw Knox but not in the right topic ! Can our moderators move these messages in the already existing thread ? The Citroën 2cv van "Wegenwacht" 1st type, from Holland, arrived last saturday. I suppose that you own all the variations ? Two new itereting acquistitions of late. First is a #127 Rolls-Royce Silver Cloud III in mateallic red with a bright blue base. I've heard of them with yellow bases and painted in dark grey. I also have another metallic red version with bright plated base. Unfortunately, all my #127s have their Spiritof Ecstasy mascot broken off! Otherwise they are mint. A very weak point I suspect. I confirm that I have also heard about yellow base plates for the 127 Rolls-Royce. The early chassis did not have the holes for the cristal boxes and were painted black as on the picture below. Could you please provide similar larger pictures of your blue and bare zamac base plates as well as a picture of your best red model 127. Beautiful item Jan. I only have two yellow , with and without windows, but I am patient ! 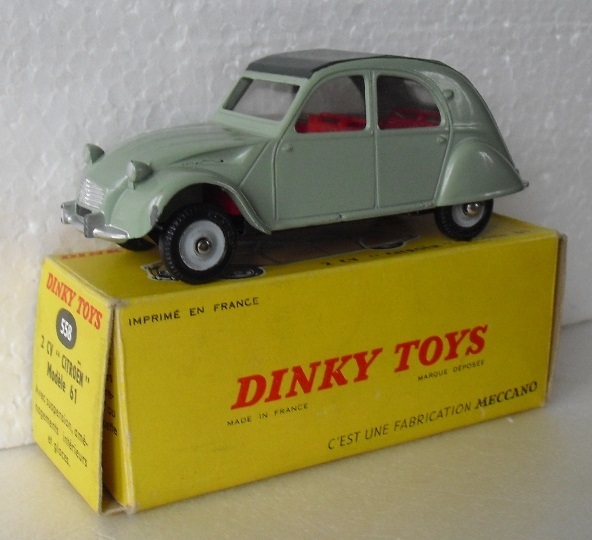 I am happy to see that you have still some places for new Dinky and that you saved some money ! My camera broke down and my new arrivals were pictured by my mobile ! Sorry for that. Have a look on the transfers ! That's Meccano quality control ! Hi Jan,Beautiful buses you show here ! You start 2018 nicely. 1st photo : UK productions with a brown body Vauxwall and smooth hubs, probably early post war and a Bedford TK coal lorry with red interior and hubs. 1)Citroên 11BL in the first navy blue version with black zamac hubs but ceiling without injection chanel. Some paint is missing but I don't care ! it's so difficult to find one ! 2)Ford Vedette 1949 with dark blue body and red hubs. Nothing special to say on the others but, perhaps, the Mercedes base plate which is paint in black. Richard—Nice acquisitions as usual. I especially like that dark blue Ford Vedette, as I have always admired that model, and have two of them. How about some additional closeup photos of it? Thank you for your friendly words. I will open soon a new topic for this Ford, that as you, I like very much. 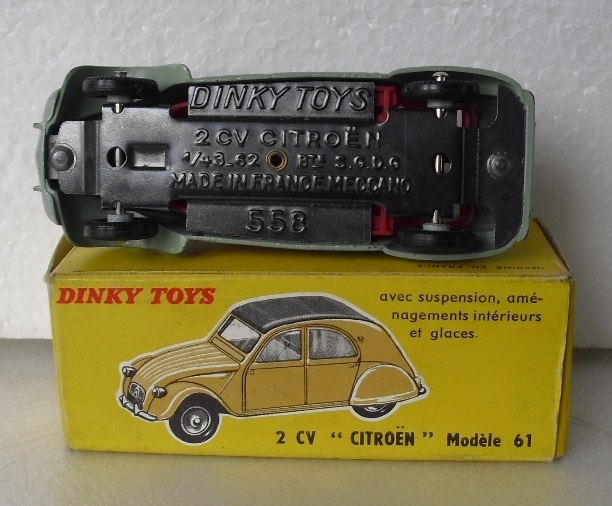 It's one of my favorite french Dinky with the Chrysler New yorker. This Jeep arrived this morning. I have opened a new thread with all my Jeep, if it can interested somebody. Some commentaries in the right topics. Jan——A most lovely model, and a very striking addition......but how does it fit into your collecting timeline? That one looks to be about perfect....very nice! 1. Very incidentally I permit myself to sin against my principles. 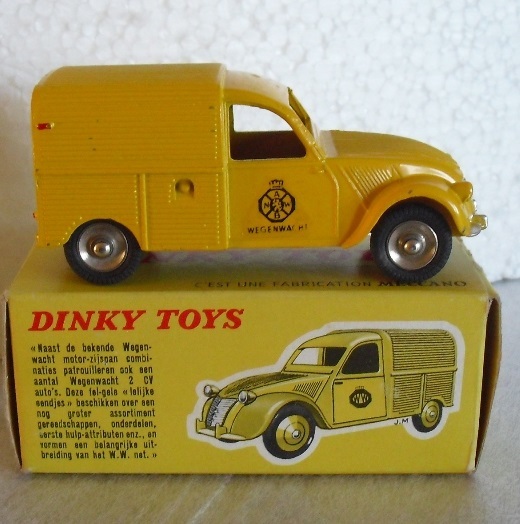 Although I do not like the majority of post-1959 Dinky Toys there are some - like this one, the Superior Criterion Ambulance and some very fine and interesting French post-1959 Dinky Toys - which I make an exception for every now and then, but not often. 2. 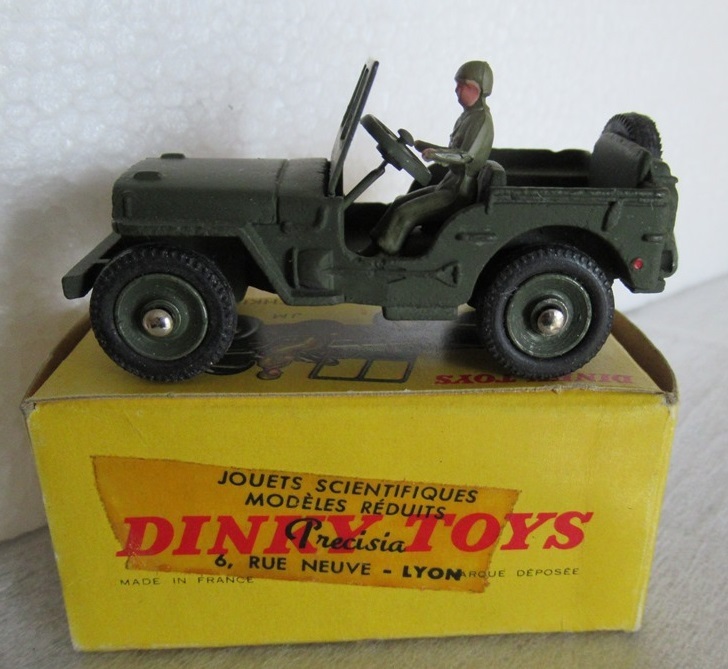 This model has a very special evolutionary link with the technical history of the Guy Warrior models of 1958 and the early 1950s Leyland Comet with Hinged Tailboard. 3. A very incidental, cheap reason: I was simply struck by its splendid condition combined with an unusually affordable price! Bought it from a vendor in France. This one is rarely seen without at least some slight chipping. Jan—No forgiveness needed......all those are great reasons, and my own personal favorite, if all else fails.....”just because”! 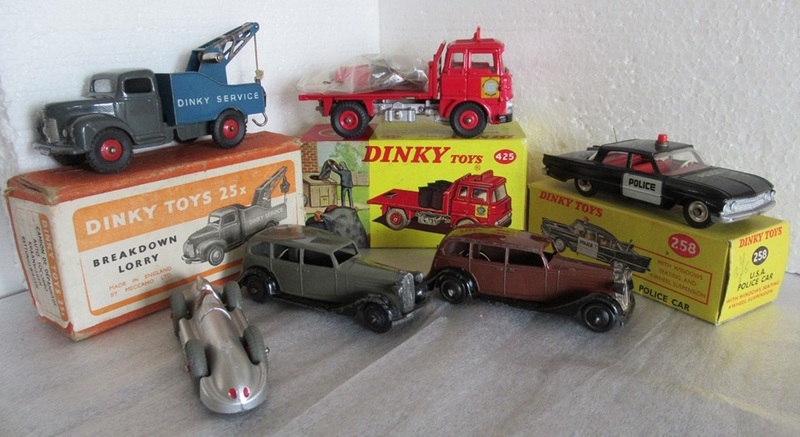 I have equally strayed, for very similar reasons, and I actually bought a very few just to see myself how far they strayed from yours and mine 1950’s ideal of Dinky Toys. And it is beautifully finished and very colorful..... I’m getting envious the more I see it!